This is my 5th consecutive blog post about cold feed or cold legs symptom that I have been experiencing for about last 10 years. I will be here showing you a way of treatment that addresses the root psychological or spiritual cause as the accumulated traumatic memories from the past. For you to understand the full context of this process, I invite you to firstly read my four related blog posts titled (1) The cause for cold legs, (2) Home remedy for cold feet, (3) Solution for perpetually cold feet and (4) Why are my legs always freezing cold. In this blog post I will be walking the next major memory imprint that attributed for me to lose my footing and grounding which manifested my cold feed. The event is me not being accepted to the graphic design middle school that I applied for and thus decided to rather attend machine engineer middle school where I experienced many traumatic experiences as described in my previous blog post. So instead of walking the next event in the timeline I am here taking one step back since I feel that this event is also very much related to me becoming disappointed about my life and creating a personality of suppression. When I had to decide what middle school to enrol in, my primary option was the Design & Photography Middle School in Ljubljana city. Soon after I applied, I received a notice from that school that they received much more applications than there were available seats. I had to take qualification test which I to my great disappointment failed to pass. I was faced with decision if I am to wait for one year and try applying again at the same school or to immediately start studying at any other middle school where they had enough seats and I would be thus accepted without having to take any qualification tests. I think it was my parents to finally convinced me that enrolling into Mechanical Engineer class at Jesenice Middle School would be the best option since it is also a kind of design process which includes a lot of drawing. It seems to also be a good decision since my father couple of years ago started with our family business where we started to produce metal constructions for industrial air purification systems and other small products from metal for the Jesenice Steel Factory where most of the people who lived in the city were employed from. Being turned down at design school was very depressing for me since I considered it as an escape from my parents who started to suppress me more and more. I was not allowed to go out in the evenings or at weekends and I was constantly needed to assist others in our metal shop. I did not like the smell and feel of the metal since there was a lot of dust and paint vapours that were created in the manufacturing process and the materials were very cold. I had no opportunity to express myself creatively during the production process and there were constantly short deadlines so I had a very little free time. Consequently I was not able to develop my drawing and design skills so that I would have a chance when competing with other kids who also applied for design school. Many had much better background since at least one of the parents was professional painter, designer, architect or photographer and my parents were none of such kind. I had to teach myself how to draw and paint without and family assistance and support. Deeply inside me I felt that this was the correct profession for me. Several years after my father stated with metal related family business, he once visited innovation fair in United States as representative of Jesenice Steel Factory and decided to import computer controlled self-adhesive foil sign-making machine. I was very excited about that and during my middle school I started to experiment with this revolutionary technology that almost totally replaced manual sign-writing profession. This was a kind of graphic design process however instead of drawing with hands, I used computer, software and the mouse that very limited my creative expression and also influenced my mind in becoming very restless and stressed. Due to international recession in metal industry that soon followed, my parents decided to completely transform our family business and we completely switched to sign-making and screen-printing services. Since my parents knew nothing about computers and graphics, my brother and I became the main producers and my parents managed the business from perspective of providing clients, materials and performing accounting. However even here I was not able to express myself creatively since my father did not understand design and cherished only the speed of sign-making and screen-printing. Such environment created big frustration within me, I started to loose my mind and had to visit psychologist for the first time in my life. When I met my first girlfriend we decided to move together to an apartment quite far away from our family business in order to escape from the tyranny of my father. But he continued to press on me that resulted in breakup of my girlfriend and me couple of years later. I then decided to completely stop working for my father and work only as graphic design and photography freelancer. That finally enabled me freedom of creative expression and I enjoyed it very much. However I still used only computer tools for creative process and was not comfortable with hand-drawing. Internally I felt restless, my mind pressed me and also due to incredible shock when my girlfriend decided to break up with me, my passion switched from creating designs to discovering how human mind works and what is the meaning of life. Even though I still enjoy graphic design to this very day, I feel that I am lacking the basics of colour and design theory and core drawing skills that prevent me from excelling as a graphic designer. Thus I am thinking about how completely different my life would be if I would be accepted into design school in distant Ljubljana city where I would be safe from oppression of my father, probably also prevented from being bullied from classmates and definitely immensely supported in developing my deep design passion. I forgive myself that I have accepted and allowed to compromise myself by taking the easy way and decided to study machine engineering instead of persisting and making sure that I study what I actually want. I realise that there are always the quick and the right options in life. Our minds tend to prefer shortcuts that create undesired consequences and time-loops while if we listen to ourselves/being the path might be longer and more challenging but also more fulfilling and satisfying. I commit myself whenever I find myself at the juncture where there are two or more option and my mind produces thoughts like: “Take the easy and fast way since why waste time and suffer!” to stop and breathe. At such moments I rather look within myself and see what I truly want and move towards that that goal no matter how long it will take and what obstacles I will have to face. I forgive myself that I have accepted and allowed to blame my parent for influencing my decision about what middle school to attend instead of realising that at the end it was me and no one else who made the final decision about that. I realise that my parents tried to be responsible and did consider all the options that they saw however since I was not passionate enough about attending design school, they directed me towards decision that they considered to be best for me and at the same time also best for the future projected family business. I commit myself to when and as I am in conversation with someone about what direction to move myself considering the mutual plans and my mind produces thoughts like: “Your personal desires do not really matter since it is more important to fit in and do what others want from you.” to stop and breathe. I then communicate clearly and directly about what I feel is my life vision and mission with others and stand firmly on my principles. I forgive myself that I have accepted and allowed myself to feel regret about me not immediately deciding to study at design school, believing that it would save me many years of troubles and assisting me in developing myself into much better and satisfied graphic designer. I realise that my imagination about how my life path would be and what experiences I would have if I would take middle school for design might be very different from what they would actually be. While design school should be supportive to develop design skills, I might still be experiencing there influences from authoritative teachers and bullies since no school is perfect and all in a way limit self in regards to full self-expression. When and as I look back to my options that I decided not to take in the past and my mind produces imagination about how my life would look like if I would take those paths, I stop and breathe. I then rather consider my current options and learn from actual past experiences to make better decisions that would compromise me as little as possible, where I would be able to express myself fully and where I would at the same time also be able to support all life as one and equal. I forgive myself that I have accepted and allowed myself to believe that he best way to lear something is to enrol in some public school instead of realising that most public schools are based on the military way of disciplining and shaping of individual into obedient follower. I realise that best way to excel in something is to learn from the masters as apprentice and from their books and courses where they have shared their knowledge and realisations. When and as I want to learn something and my mind is telling me: “Look for the closest public school or university and apply there since you will get a certificate of completion that will enable you to get a good paying job very fast.” I stop and breathe. Within realisation that quality of public schooling is very low, diplomas do these days not mean much, permanent employments are thing of the past, I rather decide to be self-taught and study from many better and easier available sources of knowledge that would enable me to excel in my profession and thus enable me to take care for myself much more effectively. I forgive myself that I have accepted and allowed myself to believe that my core passion is becoming a designer and that this is what I absolutely must focus to develop myself towards in my current life. I realise that definition of a designer is very limiting and that I as a living being have many more potentials to express myself and to perform much more tasks that to only do graphic designs. I must consider that my desire to become a designer could not actually be my life mission but only a preprogrammed idea based on how I have been influenced by my parents and environment that they have created for me where creating with Lego bricks was for example one of things that I was given the opportunity to play with. When and as someone asks me what my life passion is and my mind would serve me a thought like: “Tell them that you are a graphic designer!” to stop and breathe. I then rather expand and explain what are all the things that I am interested in and how actually I am not limiting myself to any specific profession since I want to express myself in a myriad of different ways. I forgive myself that I have accepted and allowed to resent public schooling system and teachers for influencing me in a way where I feel that I have been abused, limited and suppressed. I realise that also the public schooling system has many historical influences from governments to ideologies and individuals. People who become teachers have different starting points and abilities and combining all together, each class, school and national education system is a bit different and provides different experience to an individual pupil. When and as I think about my educational experiences and my mind produces thoughts like: “Those nasty teachers have abused and harmed me thus I have the right to hate them!” to stop and breathe. I then put myself in the shoes of every teacher that I have met and see that I would probably act no different that they had. So instead of wasting time by thinking about the past and feeling sorry for what I have become, I rather bring myself back here into reality and see how I can invest time into perfecting myself since this is where I have the power of making any real change. 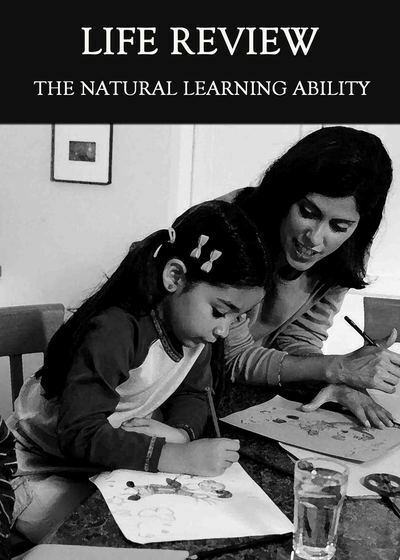 In relation to this blog post, I invite you to assist also yourself with awesome self-assisting tools within DIP Lite course and to listen to educational audio titled The Natural Learning Ability from the Life Review series at Eqafe web store with hundreds of extremely supportive educational items that hold answer to any imaginable question about life and this existence.